1. For salmon confit: Coat fish liberally with salt (there should be coating of salt on surface) and set aside. 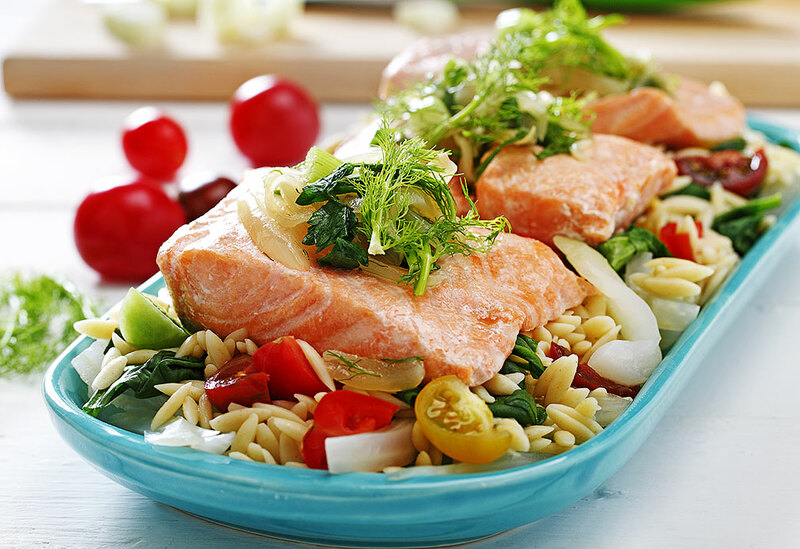 If salmon fillets are thick, they can be left in refrigerator overnight. If portions are thin, leave in refrigerator for 1 hour. 2. In saucepan, combine salt, basil, thyme, bay leaves, garlic, peppercorns, chile and canola oil and bring to bare simmer for a few minutes; do not brown garlic. 3. 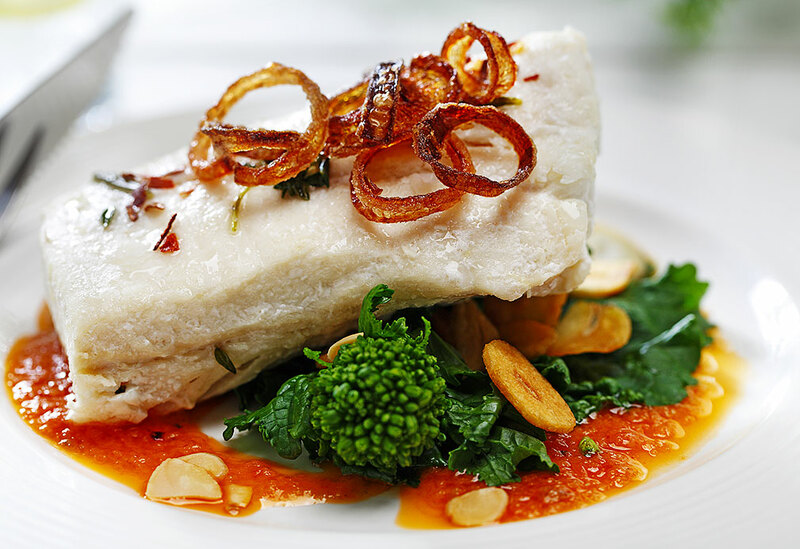 Brush excess salt off fish and, in batches, gently poach in canola oil confit until cooked. Set cooked fish aside, cool canola oil confit mixture and brush over fish. 4. For Fennel, Parsley and Onion Compote: In sauté pan, cook onions in canola oil until caramelized and season with salt and pepper; set aside. 5. In saucepan, place fennel with just enough water to cover; bring to simmer. Cook until tender. Drain and set aside. 6. In saucepan, place onions over low heat, add chopped fennel core, parsley and some chopped fennel fronds. Adjust seasoning with salt, pepper and lemon juice. 7. For orzo: In large pot, cook orzo in water until tender. When cooked, add spinach leaves and drain well. 8. Place hot, drained orzo and spinach leaves in bowl and add diced tomatoes, lemon zest, parsley and canola oil. Season to taste with salt, pepper and lemon juice. Serve hot with salmon confit, fennel, parsley and onion compote. Salads, sauces and stuffing ... oh my! 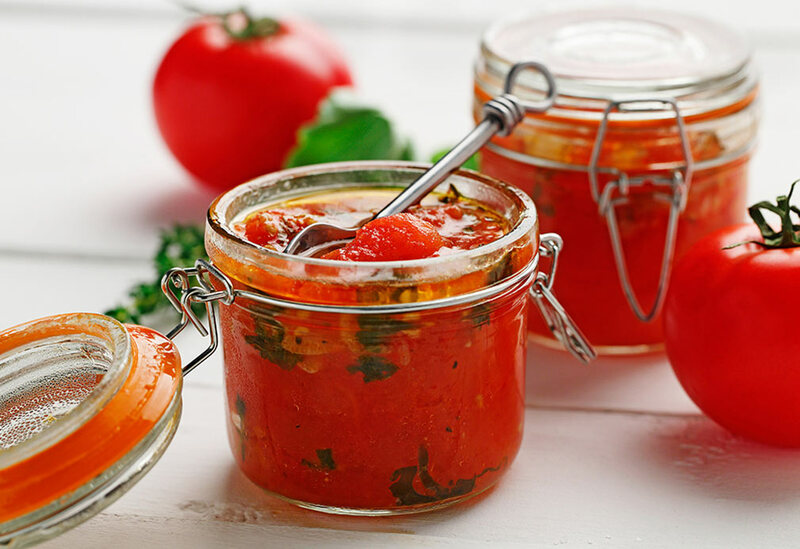 You’ll find endless uses for tomato confit in your kitchen. Canola oil’s mild taste lets all the sweet and savory flavors shine.